(Nanowerk News) An international team of scientists has discovered a new, exotic form of insulating material with a metallic surface that could enable more efficient electronics or even quantum computing. The researchers developed a new method for analyzing existing chemical compounds that relies on the mathematical properties like symmetry that govern the repeating patterns seen in everyday wallpaper. 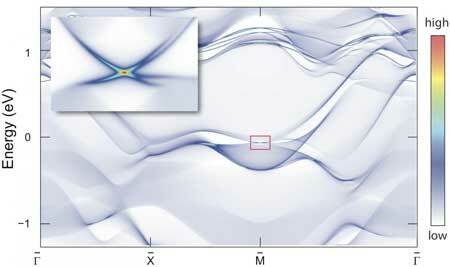 The research, appearing in the journal Science ("Wallpaper fermions and the nonsymmorphic Dirac insulator"), involved a collaboration among groups from Princeton University, the University of Pennsylvania (Penn), Sungkyunkwan University, Freie Universität Berlin and the Max Planck Institute of Microstructure Physics.